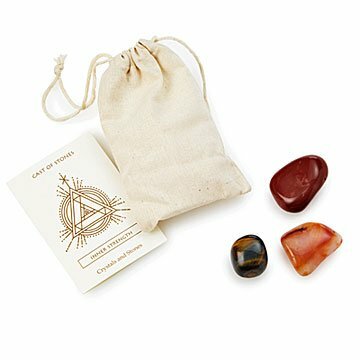 This globally sourced and thoughtfully grouped trio of stones is a reminder of your inner strength. Let this set of three naturally beautiful stones serve as a reminder that your inner strength is always there, waiting to be tapped. The stones are sourced from around the world and grouped to emphasize strength: Carnelian is associated with creative confidence and a courageous approach to new projects; Red Jasper is thought to promote self-trust and aid in critical thinking; Tiger's Eye is a symbol of balance and overcoming fear and anxiety. The trio is accompanied by an affirmation card with the message, "I have the strength to overcome obstacles, and the willpower to accomplish anything." Carry them in their cotton drawstring bag for everyday inspiration or add them to your decor for an earth-centered touch. Packaged in Los Angeles. These brought some extra peace of mind and not to mention they are beautiful!